Hogan (R) signed an executive order calling for the state of emergency, an instrument many jurisdictions use to coordinate anti-opioid and heroin strategies. The action fulfills a campaign promise he made in 2014 but temporarily shelved after taking office in favor of other legislative and executive initiatives. The governor, who lost a cousin to addiction years ago, said the declaration underscores what he described as “an all-hands-on-deck approach” to growing rates of heroin, opioid and fentanyl use. 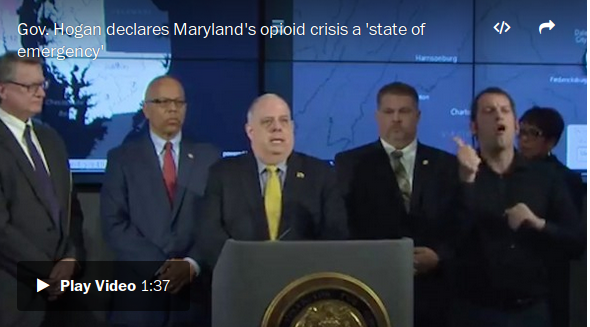 “The reality is that this threat is rapidly escalating,” Hogan said, appearing with Lt. Gov. Boyd Rutherford (R) and a large contingent of state officials at the command center of the Maryland Emergency Management Agency outside Baltimore.